Naw, the Vorlons aren't evil just as the Shadows really aren't evil. They represent an ideology: order VS chaos. I don't even think Ulkesh was necessarily evil, just fanatic and narrow. I love Claudia's work. I can't find any weak moments, but I see her as this strict Russian who never lets emotion out. It's not entirely easy for her to BE emotional (Ivanova.) 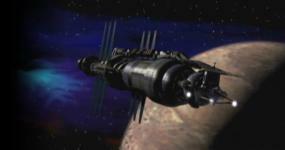 One of my favorite expressions from her is when they're sending Kosh's ship away and it goes into the sun. The look on her face, the tears in her eyes. Her looks say more than any words could. And the scene when she is crying in Franklin's arms is one of the most harrowing and heart-breaking scenes I've ever seen on television. Where she tended to come up short (at least in comparison to the likes of AK, PJ, and MF) was when she needed to summon emotion entirely internally (such as entering the scene cold to tell Sheridan about EF's destruction of unarmed refugee ships). Is it really fair to compare anyone's acting skills to Mira, Andreas or Peter? They're in a class all their own, IMHO. Well I guess it depends on what we mean by "evil." I personally don't like the word because it seems to imply that it's some sort of force that gets a hold of people or something. So to me, "evil," is the same "really bad things," defined by some sort of morality and ethics that we as humans decide is right and therefore judged by action, not justification, for everyone has some sort of "justification." Serial killers were abused, Saddam Hussein was "pacifying" his population, Hitler and Milosovich were preserving their race, the janjaweed right now are protecting their own, etc. All "justified"- all evil. but I see her as this strict Russian who never lets emotion out. Yeah, that's the idea, but she sure does let it out a lot. You also have to take into consideration the character and the way their parts are written. Kosh certainly had his share of horrors on his hands. But he also restrained the other Vorlons from doing even worse things, and eventually (through his relationship with Sheridan) was redeemed. I always wondered who Kosh was in the hierarchy of things. He had to be pretty important to the Vorlons. For some reason I always hear the song Xanadu in my head when I hear/see Z'ha'dum. I don't think it compares to Xanadu though. ....picturing Olivia Newton-John as The Eye.